Homemade sourdough bread, delicious and healthy. Here’s how! I recently received interesting post from England — a little plastic bag with a grey brownish ‘blub’ inside. 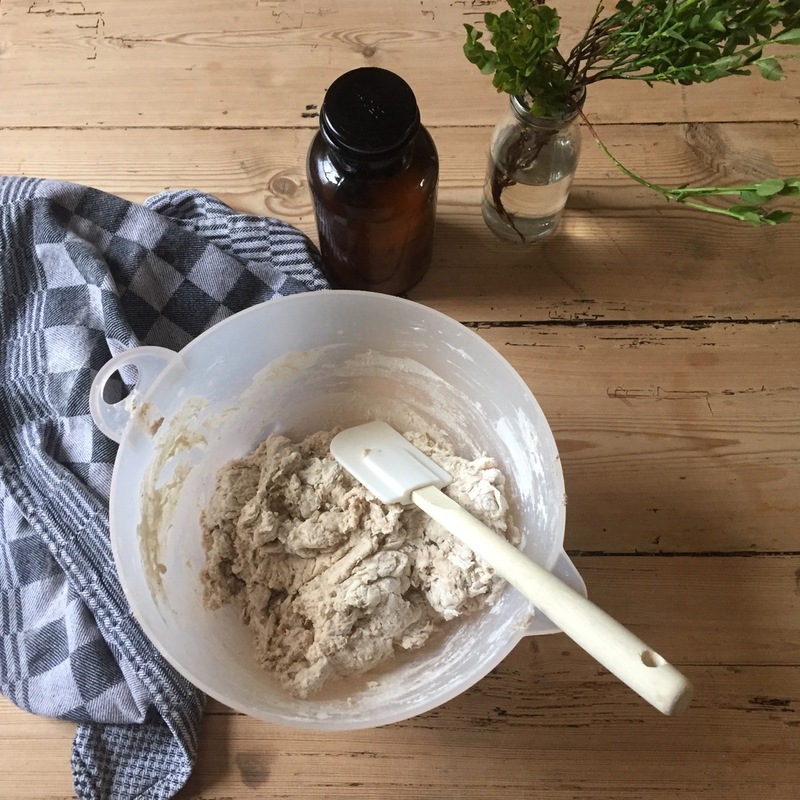 This ‘blub’ was highly anticipated as it happens to be a sourdough starter — a culture of naturally occurring bacteria and yeast which can be used to bake delicious and healthy homemade sourdough bread. We have since been baking our own bread and pancakes and are loving the beauty of the sourdough process! Hello, I’m Nomi and I live with my British husband and three children (Aoife, 8; Fergus, 5 and Nora, 2) in the beautiful (but usually incredibly rainy) North West of England. 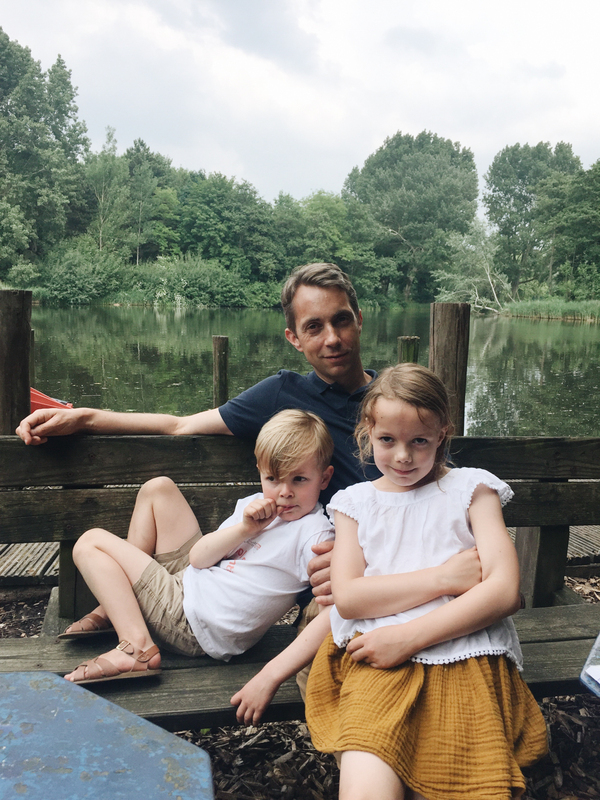 I myself am Dutch and we are raising our kids bilingually, or at least we try to! 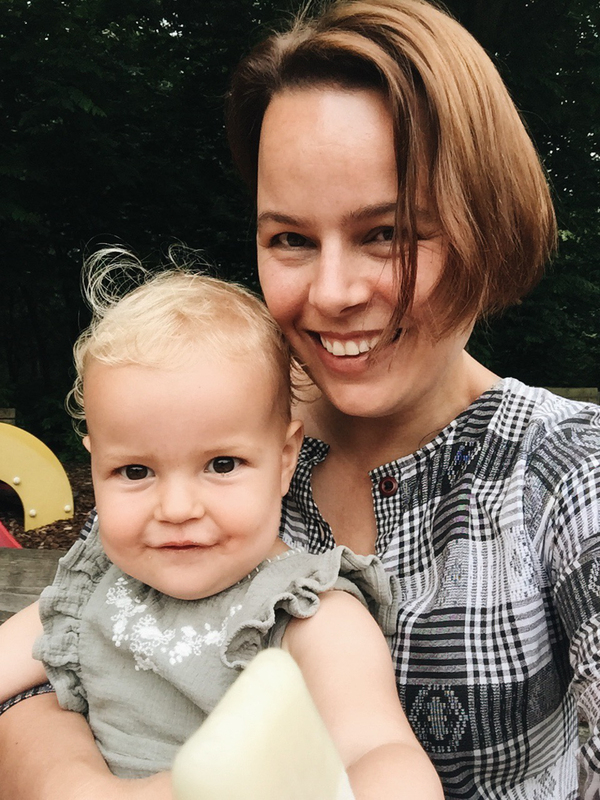 I have a PhD in psychology of language, and some of my research involved bilingualism, so it is interesting to see how all those theories I learnt about play out in daily life. Lancaster, where we currently live, is surrounded by beautiful countryside, so at the weekends we often venture into the great outdoors and enjoy ourselves in the woodlands and the hills of the Lake district. We all love walking and being in nature. We have an allotment where we grow our own vegetables and lots of berries and as parents we really try to install a sense into our children that there is pleasure to be found in the simple things in life, like growing your own, playing in puddles and streams and being creative. My favourite thing to do is when my kids’ school sends a message that one or both of the children need to dress up as something, and I get the chance to create a costume for them (often with limited materials, since the school can sometimes give pretty short notice!). 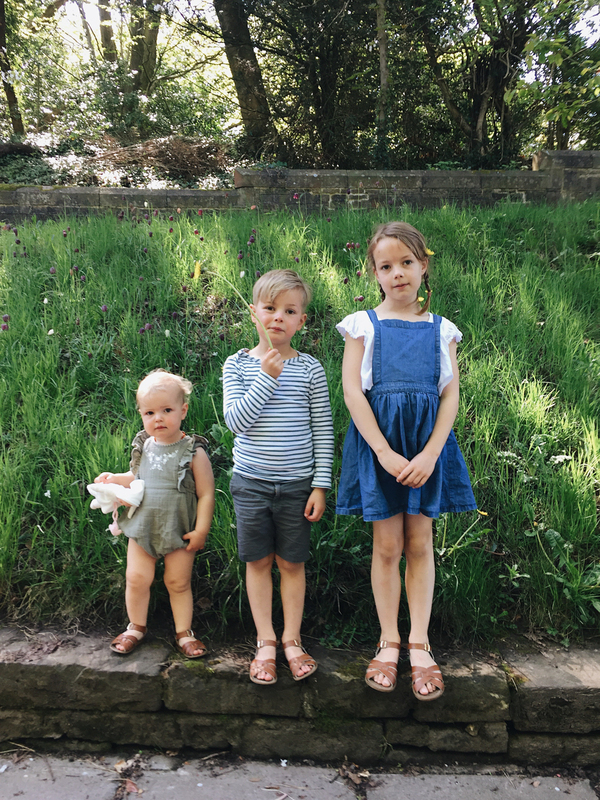 I love making things, and you can often find me doing so, whether it is sewing, knitting, crafting, baking or cooking, and perhaps unsurprisingly, luckily my children love being creative too! A year and a half ago our family of five expanded by one. Not another baby, nor a pet, but I was given a little bit of sourdough starter to care for and to bake with, together with a recipe, and it has been with us ever since. We even took our starter to live with us when we all went to Rome for my husband’s work for a while! The bread that I have been baking with it is so tasty and looks as good or better than any rustic bread you can buy at an artisan bakery (and at the fraction of the cost) and I really like it that it only takes two ingredients to make your own starter (flour and water) and three to bake a loaf (flour, water and salt)! Homemade sourdough bread is kinder on the digestive system and contains fewer gluten than yeasted bread. You can easily make your own starter in a few days, as it grows on the naturally occurring wild yeasts in the air. Especially in this warm weather! If you don’t have a starter you can find the recipe here, or buy some online (Amazon sells it!) but by all means ask around if someone you know happens to have some already. 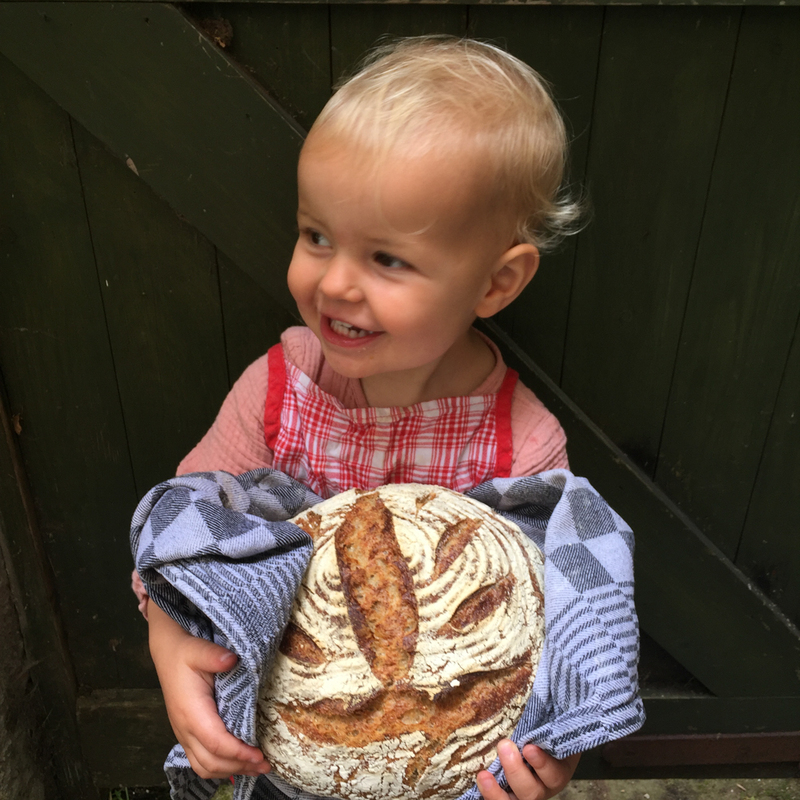 Sourdough folk tend to be more than happy to share their starters, since it makes it easier to retrieve it when yours happens to run out, or ‘dies’ if you’ve neglected it for too long! (However, I’ve found mine to be very tolerant of slightly neglectful behaviour if I keep it in the fridge!). So how does it work? You need a to be feed your starter regularly to keep it happy. This means daily if you keep it on your kitchen counter, or weekly/bi-weekly if you keep it in the fridge. In both cases keep your starter in a jar with a loosely fitting lid so air can still get in! Feeding always goes like this: you put a little amount of existing starter in a large bowl, say 50 grams, and add the same weight in water and flour (it’s best to go by weight and not volume in this case), effectively tripling the amount (in this case you would end up with 150 gram of starter). Stir and set aside covered with a loose fitting lid, or a wet tea towel somewhere and wait for it to become bigger and bubbly. You are looking for it to become at least twice as voluminous and full of little bubbles, which mean that your starter is happy! Of course the amount of fed starter you want to end up with depends on how much you need for baking that week. With experience you will know what works for you and your family. I usually feed my starter once a week like this to keep it nice and alive, and then take small amounts out for my loaves which I then feed on the day to reactivate. And now on to the recipe for my bread. 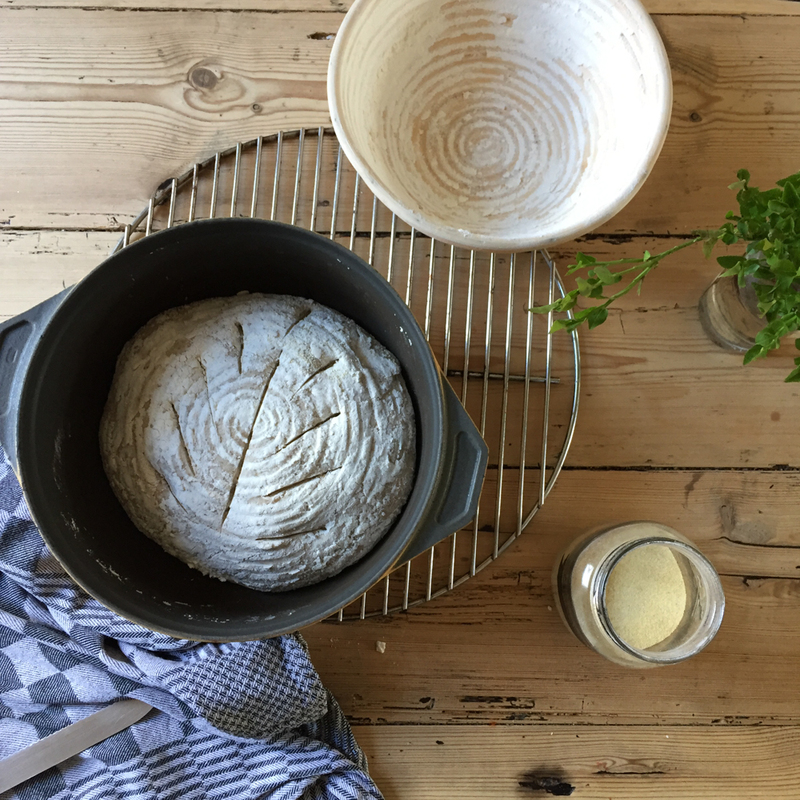 I use the ‘basic sourdough recipe’ from sourdough.co.uk and have found that whenever friends have trouble with their own sourdough loaves, as soon as they start using this recipe, their bread becomes just as wonderful as mine, so I dare say it is fool proof! As I mentioned before, in the morning I take 50 grams of starter from my jar in the fridge, put it in a big bowl and feed it with 50 grams of rye flour (my starter likes rye), and 50 grams of tap water (cold or luke warm). I mix it together and leave loosely covered to become active during the day. Then after bedtime I take my leaven (the activated starter), and add 300 grams of water, 100 grams of strong wholemeal flour and 400 grams of strong white flour. I mix it quickly with a wooden spoon and leave it between 30 minutes and 2 hours. Next I mix the salt with 15 grams of water, and add that to the dough. I push it in slightly with my fingers and leave it to seep through for about ten minutes (can be longer if you want). Then it is time for the first knead, which is actually not really a matter of kneading but of picking up the dough on one side, stretching it upwards towards you and folding it double. Turn the bowl a quarter turn and repeat until you’ve stretched and folded the dough at least four times. No need to take it out of the bowl at all! Repeat this ‘kneading’ two to three more times (every time doing the four turns) at half hour intervals during the rest of the evening and then by the time you go to bed, you can take your dough, fold it back into itself so the top gets slightly stretched and taut, while all the loose ends are gathered on the opposite side and then it is time to lay your dough to rest for the night. 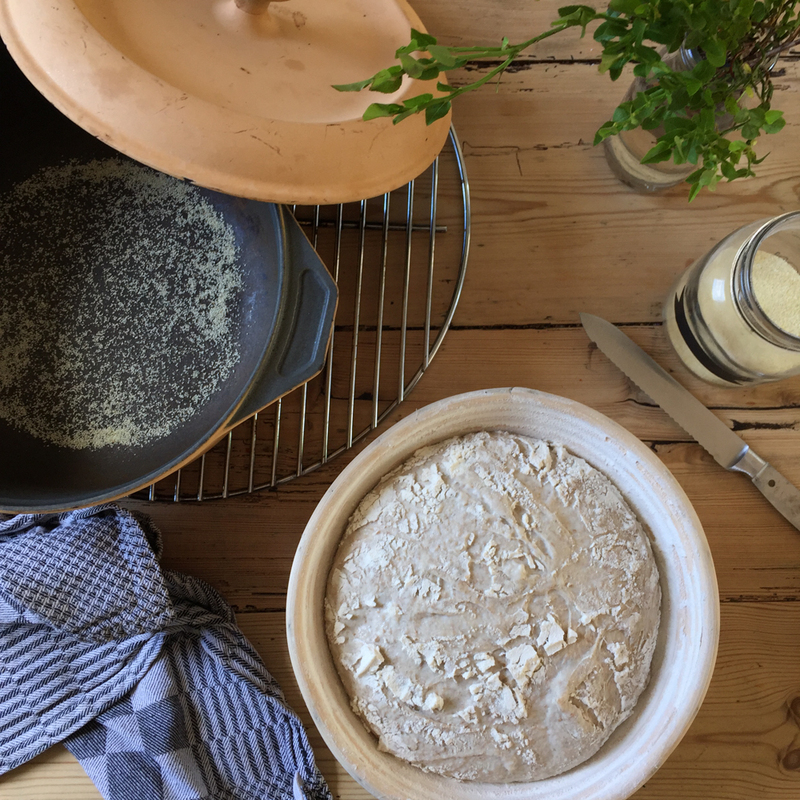 I use a thickly floured proving basket (a banneton) for this, which creates a beautiful spiral pattern of flour on my bread, but if you don’t have one of those use a colander lined with a tea towel and sprinkled with ample flour instead. I have done this a few times myself when I wanted to prepare more than one loaf at the time, and it works fine. Make sure you put the ‘knotted’ side of the bread up and the top down, sprinkle with flour and cover with a wet tea towel and put in the fridge overnight. If this all sounds a bit too laborious, please know that I have found the recipe to be very tolerant of forgetting a kneading round or two, leaving the salt in for too long before you start kneading, or the intervals between the kneads too long. Basically, as long as everything is mixed in and you stretch the top nicely, if you manage to put it in the fridge overnight before you bake you will end up with a pretty nice loaf in the morning! Before you can bake, put your cast iron pot with the lid into the oven and preheat it at 220 degrees Celsius. Take the pot out, sprinkle the bottom with semolina so the bread won’t stick and then turn the proved dough into the pot, with the knotted side down (I hold my banneton upside down above the piping hot pot, keeping my fingers on the dough and once I feel the dough move down I remove my fingers and let it drop; it’s a bit of a trick but it works). I slash the top of the dough a couple of times using a small serrated knife (I like to do a leaf pattern, but a simple line or cross works fine too). The cuts will give the bread somewhere to go when it expands in the oven. Don’t worry if your bread hasn’t risen much (either outside the fridge the evening before, or overnight when kept cool): I find that the best ‘oven spring’ occurs when I use the dough straight from the fridge! Put the lid back on and move the pot back into the middle of the oven to bake at 220 Celsius for 50-60 minutes.The cast iron pot with the lid on will trap the steam from the dough which creates a lovely crust. Then remove the lid and give the bread another 10 minutes at 180 degrees Celsius to brown before you take it out. That’s it! I have done variations using only white flour, or rye instead of the wholemeal, I sometimes use my starter straight from the fridge and take 100-150 grams straightaway without first feeding it and I have even taken a part of my rye starter and begun feeding it on strong white flour only to create a white starter, which I use for pizzas and bagels, but I may save those recipes for another time here at babyccino! Good luck and don’t forget to hand out bits of your starter to friends and family (they might make lovely teacher’s presents too when packed in a cute jar with a recipe attached)! Thank you so much for this recipe. After a failed attempt a few years ago, I used your recipe this week and it was brilliant. Will definitely be making more! Red beet greens and goat cheese quiche. Delicious! Bunny Cake -- fun for Easter celebrations and birthdays too!